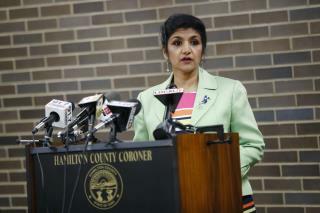 (Newser) – The death of Otto Warmbier is a mystery and it will probably stay that way unless somebody from North Korea comes forward with information, Hamilton County Coroner Lakshmi Sammarco says. At a press conference in Cincinnati Wednesday, the coroner said the American student's death was caused by complications from brain-damaging oxygen deprivation around six months into his imprisonment in North Korea, but the cause of the initial "insult" could not be determined, reports Reuters. "We don't know what happened to him, and that's the bottom line," she said. Warmbier's family declined an autopsy, but Sammarco said a CT scan served as a "virtual autopsy." So many allegations and misinformation on this file. Otto had no business going to North Korea in the first place. You're just asking for trouble to go where you're not liked. A post mortem was conducted? Yes or No? Two different stories, where are the results????? Judging by his actions that led to his death I'm guessing Warmbier's brain damage was what the Obamacare for lunch bunch call a 'preexisting condition'. the last article stated that the Warmier's did not want an autopsy on their son,,,,,they are Jewish and that it probably why....it's too bad that religious belief gets in the way of justice, in this case. would have helped a great deal, i think to have autopsy.